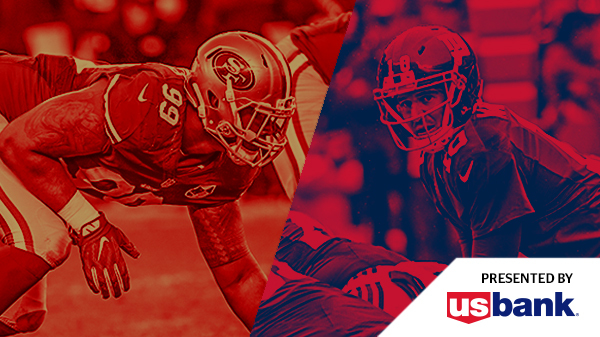 The San Francisco 49ers will take on the New York Giants on Sunday, November 12 at 1:25pm at Levi’s® Stadium. For information on 2017 49ers season tickets, sign up here, call 415-GO-49ERS, ext. 2 or email sblsales@49ers-smc.com. Single game tickets are now available for purchase on Ticketmaster.com and there is a strict limit of eight (8) tickets per each game on a first-come, first-served basis. For groups 20 or more, please email grouptickets@levisstadium.com for more information. We recommend that fans purchase parking passes in advance – passes purchased in advance will receive a $10 discount off the day of game purchase price. Parking passes are also available on Account Manager. We ask that all guests attending the 49ers vs. NY Giants game presented by U.S. Bank, please review the stadium event guide prior to your arrival. All guests ages 2 and above must have an event ticket to enter the stadium. There will be no re-entry after admittance. Guests should have their tickets ready to scan upon approaching the stadium entry gates. The ticket barcode must be visible no matter the ticket type. Will call will be located at the Visa Box Office and will open at 9:55am. Walk-up tickets will also be available at the Visa Box Office. The Visa Box Office will be open at 9:55am and is located at the north end of the stadium inside Toyota Gate F.
Bag check locations are located at Toyota Gate F, Intel gate A and Dignity Health Gate C for guests to check-in any bags that are not in compliance with the bag policy. Click here or below to view all available inventory for this game and take advantage of these gameday enhancements while they are still available! Fans are encouraged to check out the Faithful Mile presented by Global Syn-Turf, the official pregame destination for 49ers home games at Levi’s® Stadium. This 60,000 square-foot space includes two expansive Bud Light bars, live music and entertainment at the Pepsi Stage and customized activations from California’s Great America, KNBR, Orig3n, SAP, Toyota, Welk Resorts, 107.7 The Bone, and Yahoo! It will also serve as the backdrop to the NBC Sports Bay Area Pre-Game Show, which will give fans an opportunity to be a part of the show before kickoff! 49ers fans – join us pregame out on the Faithful Mile at the Levi’s Mobile Tailor Shop. 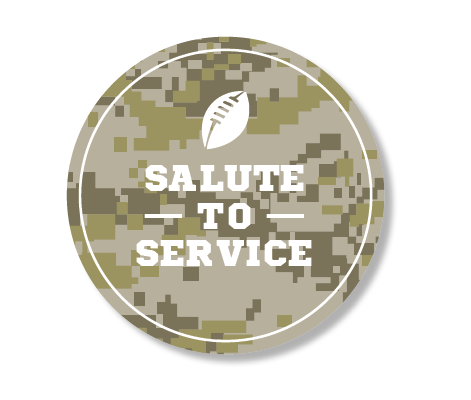 Don’t forget to bring your Levi’s trucker jacket to receive your limited-edition Salute to Service patch honoring U.S service members, veterans, and their families. Remember, good things happen when you Live In Levi’s. For a full list of gameday promotions and activations including the gameday giveaway that all fans will receive, please click here or click the button below. Did you know you’ll receive a $10 discount off the standard purchase price if you buy in advance on the 49ers or Levi’s® Stadium mobile app? Parking lots are scheduled to open at 9:55am and all guests must be in possession of a valid event ticket, pass, or credential to park in a designated parking lot. Cash lots (day of event parking) will be made available on a first-come, first-served basis in all parking lots. Prices vary per lot and will be $10 higher than if purchased in advance. 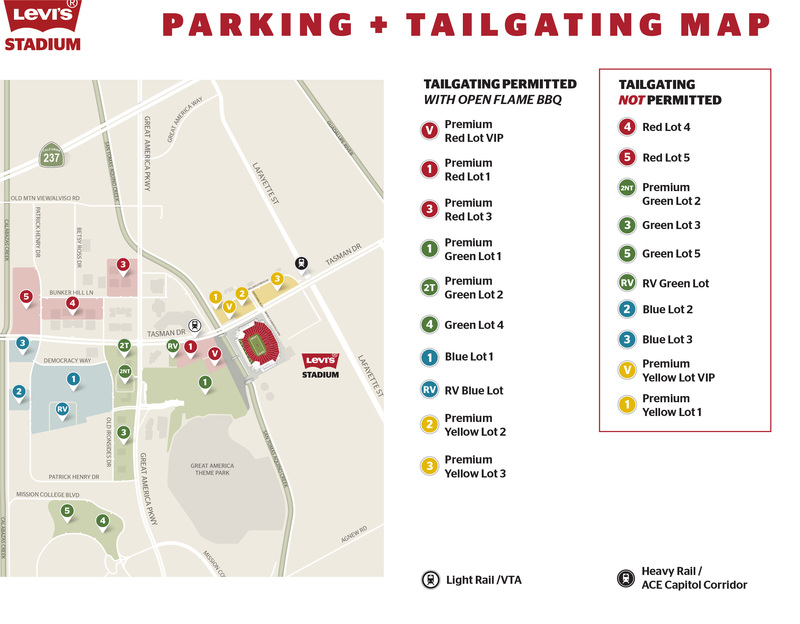 Mobility services will be onsite at 9:55am to provide roving carts throughout Green Lot 1 for assistance to stadium gates. Shuttles will be provided from Blue 1 to Gate C for mobility assistance guests. Bicycle parking will be located outside of Intel Gate A pedestrian bridge and Dignity Health Gate C pedestrian bridge. All ticketed guests will be permitted the use of the San Tomas Aquino Creek trail beginning at 9:55am. The Silicon Valley bicycle coalition will be administering this operation. Buses/oversized vehicles or Charter Buses that do not wish to tailgate must park in Blue RV and purchase parking in advance by contacting the Visa Box Office at 408-579-4449. You can also purchase parking through the 49ers or Levi’s® Stadium App. Please note, the stadium bag policy will be enforced for all stadium events including concerts, matches and 49ers home games, unless otherwise noted. 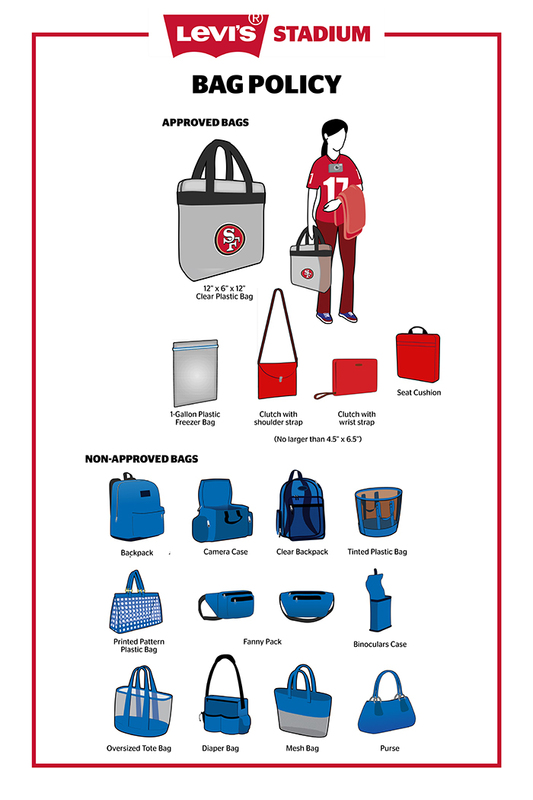 Should you have any questions regarding the bag policy, please email guestservices@levisstadium.com. Fans with medical bags or items they must carry with them must be inspected and either have a wristband or sticker placed on it to show that it has been inspected. PLEASE ARRIVE EARLIER TO AVOID LAST MINUTE GATE PRESSURE. Food and fruit (must be cut into pieces). Failure to follow the directions of law enforcement, security, ushers, ticket takers, or any other Levi’s® Stadium personnel. * Umbrellas are allowed in the stadium provided they do not obstruct another guest’s view or pose any safety hazard. ** Please contact your nearest guest services representative if you are in need of storing a baby stroller or wheelchair as they are not permitted to be stored in the seating areas. Use the Uber app for a safe, reliable, and affordable ride to Levi’s® Stadium events. Enjoy $15 off your first ride by downloading the Uber app and entering promo code LEVISSTADIUM2017. Uber is the official ride-sharing partner of Levi’s® Stadium. Uber is the official ride-sharing partner of Levi’s® Stadium and will have a designated pick-up location for this event at Red Lot 7. At the conclusion of the event, guests using the Uber app, should exit Levi’s® Stadium through Intel Gate A or Toyota Gate F and follow signs to Red Lot 7 via the San Tomas Aquino Creek Trail and/or Great America Parkway. We ask guests to open their app and request a ride once they arrive to the Red Lot 7. Caltrain provides services from San Francisco to South San Jose with stops all along the peninsula. On event day, Caltrain transports passengers from all locations to connect with VTA light rail trains or buses at the Mountain View Transit Center, located at Evelyn Ave, and Castro Street. For more information, please visit www.caltrain.com, or call 1-800-660-4287. Levi’s® Stadium takes pride in providing elite service to all guests including those requiring mobility assistance. We provide a variety of services for our guests with special needs. Included in these services are courtesy shuttle buses from several of our parking lots, golf cart shuttles in the Main Lot, and Guest Services representatives to provide wheel chair service if requested. Guests that require additional assistance are encouraged to contact our mobility assistance team at 408-579-4610 or email mobilityservices@LevisStadium.com. 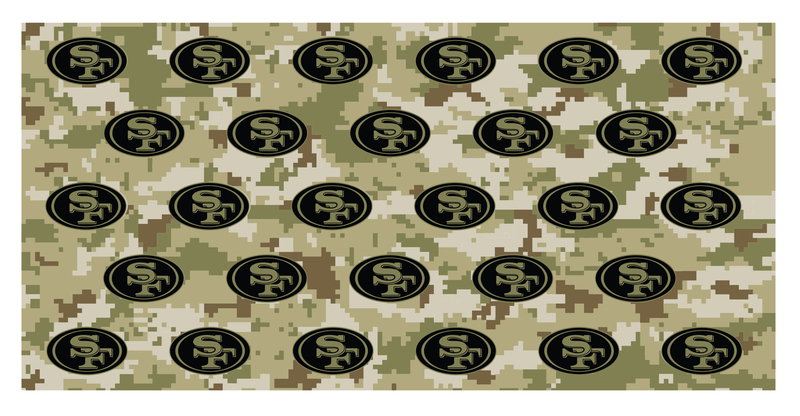 All fans in attendance will a 49ers Salute to Service Yowie® – multi-functional rally towel. Fans the Dignity Health Play Kind Zone is open pregame through the end of halftime for families attending the game with young children. The Youngest of the Faithful can partake in skills and drills, take a trip down a larger than life football slide, get their “My First 49ers Game” credential or enjoy complimentary face painting, air brush tattoo’s or game day hair coloring. Be sure to visit the Dignity Health Play Kind Zone at Gate C.
Need some juice? Fans can also charge their mobile devices at one of the Verizon “Juice Bar” Charging Stations located on the 300-level main concourse. Hey Fans – throughout the season, Mondays are now 49ers Mondays at Papa John’s! Every Monday during the season get 49% OFF your online order of regular menu price items using promo code 49ERS online at papajohns.com. *Valid at participating San Francisco Bay Area locations. 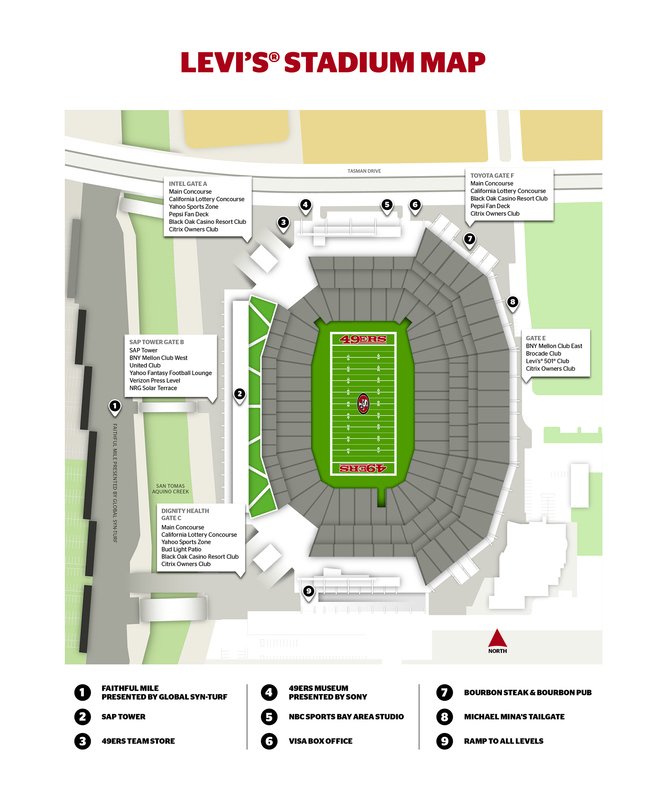 Other areas for fans to check out in the stadium include the car display and giant 49ers helmet in the Toyota Plaza, and our interactive concourse activations from Comcast, SunPower, View Glass, and Yahoo (all located on the 300-level concourse). SAP will also have interactive pillars/ cube available in the SAP Tower Atrium! The 49ers are in for the win, and in for the burgers. If they score two or more touchdowns today, you score a Free Jumbo Jack on Friday, September 22 when you purchase a large beverage. Just mention the 49ers when ordering at a participating Jack in the Box! Bid on authentic 49ers memorabilia during each home game and take your prize with you after the game at the CSD auction locations at the Brocade Club, Levi’s® 501 Club, United Club, Toyota Gate F and Section 124. Bud Light, Levi’s® Stadium, and the NFL want to remind adult fans (21+) to be a Bud Light Good Sport by drinking responsibly, being or using a designated driver or otherwise ensuring you have a safe ride home. The Bud Light Good Sport Designated Driver Program provides one complimentary small soft drink to those who pledge to be designated drivers on event day. Guests can register for this program by visiting one of the Designated Driver kiosks or the Guest Services Stations located throughout the stadium. Each game, one lucky winner will be chosen from all sign-ups and win a prize courtesy of the 49ers and Bud Light. The 49ers and Esurance are teaming up to reward the Faithful! Esurance will surprise the first 50 fans on game day with a free bus from Mountain View CalTrain Station to Levi’s Stadium… Just follow Esurance on Snapchat on the morning of the game to track the bus’s location, and for your chance to score a free ride (and more)! Win Two Nights at Black Oak Casino Resort: Fans – if they 49ers get 300 offensive yards on gameday, two lucky fans in attendance will win two nights at Black Oak Casino Resort! IdentoGO will be providing TSA Pre✓® enrollments onsite at home games. Bring your passport OR birth certificate and driver’s license/state ID to the blue TSA Pre✓® RV parked in Faithful Mile. Enroll and be entered into a raffle to win an autographed item. You can also schedule an appointment for gameday ahead of time at www.identogo.com/sanfran. Red Zone Rally is the premier all-inclusive pregame party at 49ers games that takes place at Great America Pavilion. For three hours prior to kickoff, Red Zone Rally pass-holders enjoy top-of-the-line food and beverage offerings in a private, air-conditioned space. If you are interested in purchasing a Red Zone Rally pass for the 49ers vs. NY Giants game, please click here. Intel and Amazon Alexa are bringing the Smart Life Roadshow to Levi’s® Stadium Sunday, November 12. Come tailgate in the coolest Airstream with the hottest tech located in Faithful Mile! You will have an opportunity to demo some of the best smart home devices and learn how to easily integrate Alexa into everything in your home. Plus, you will have a chance to enter to win an Echo Dot with our daily giveaway drawing. Please find the locations of sunscreen dispensers located at Levi’s® Stadium. 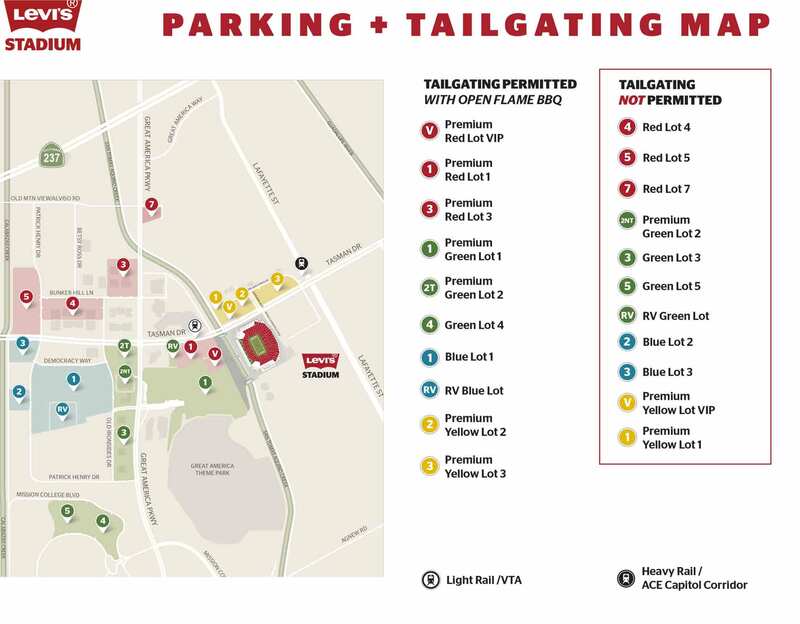 For fans riding VTA Buses, taxi or rideshare, Uber or who have parked in Yellow Lots 2, 3 should exit via Toyota Gate F.
If you’re interested in a luxury suite rental for this event, please fill out the form below or contact us at 415-GO-49ERS, ext. 2 or premiumhospitality@49ers-smc.com.